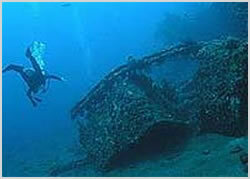 Named after a cross marking the landing spot of the first Christian missionaries to Irian Jaya this wreck is upright on the sandy bed at 18 meters. The Japanese patrol boat is the most accessible of all Raja Ampat wrecks, depth charges and the ships lamps can still be seen. Penetration is possible to the communications room, engine room and front hold where features such as the switchboard and ammunition can be seen. Coral cover is good and plenty of reef inhabitants now call the wreck thier home, these include lionfish, huge napoleon wrasse, humphead parrotfish and all manner of critters that come our especially at night. At the end of the Cross Wreck is this delightful little area back towards the beach. In amongst the sand and rubble are a vast array of critters including frogfish, leaffish, devil scorpionfish, seahorses and mantis shrimp.